The Hypermind Boardgamers Turn 5! Home > 2012 > January > The Hypermind Boardgamers Turn 5! Just over 5 years ago, I reached out to a few local gamers on BGG and some of the regulars already hanging out at my FLGS to start a weekly boardgame group. On January 16, 2007, we met that first time to play Settlers of Catan and begin our exploration of what has now amounted to over 483 different games. 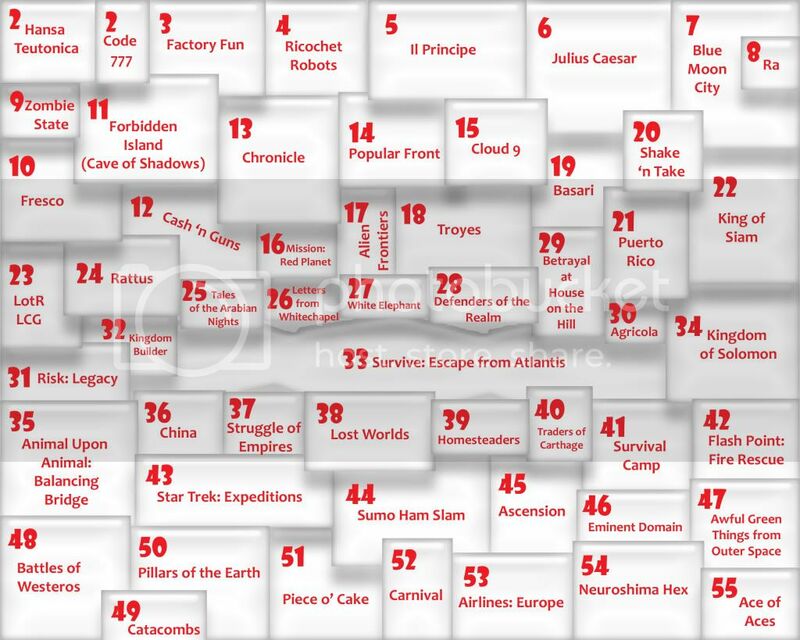 Race for the Galaxy continues to top our list for the 4th year in a row, even though its plays continue to decline. All of our Games of the Month! (7 Wonders, Factory Fun, Fresco, Puerto Rico, London, Alien Frontiers, The Lord of the Rings LCG, Lost Worlds, Troyes, Letters from Whitechapel, Homesteaders, and Catacombs) were represented on the list, which is really cool and is sort of the whole point of the GotM! program, I suppose. What is the game you would recommend as quick fillers to start or finish the evening, or to fill in the gap between longer, more involved games (5-30 minutes, on average)? Chronicle – This was my personal choice, and really, was the clear standout for us in the “really short card game” category. It’s relatively familiar as a trick-taking game, but the variable scoring conditions and card powers really shake it up and make it very interesting and replayable. If you were going to introduce someone new to the modern boardgaming hobby or just looking for a lighter strategy game, what would be the top game you would choose? Kingdom Builder – Kingdom Builder has had a pretty mixed receptiopn in the boardgame community, but we’re pretty happy with it here in Burlington. Especially as the light/”gateway” game, it’s really solid (especially with Sceadeau’s variant, which I consider indispensible at this point). It wasn’t at the top of my list (that would have been Survive, actually), but I still have a lot of interest in continuing to explore it more, which is really nice in a light game. Which game seems to have the best incorporation of setting and theme? Letters from Whitechapel – I’m assuming here that people are thinking more of the “theme” of the chase rather than the actual killing of prostitutes. And if so, then I totally agree. Which game had the most elegant, innovative, or all-around best game mechanics? Belfort – Belfort is a mash-up game that brings a ton of different mechanics to the table and integrates them really well, so I can see how it was a good choice. Personally, I focused more on the “innovative” part and gave my top vote to Risk: Legacy (regardless of how “good” I may actually think the game is). 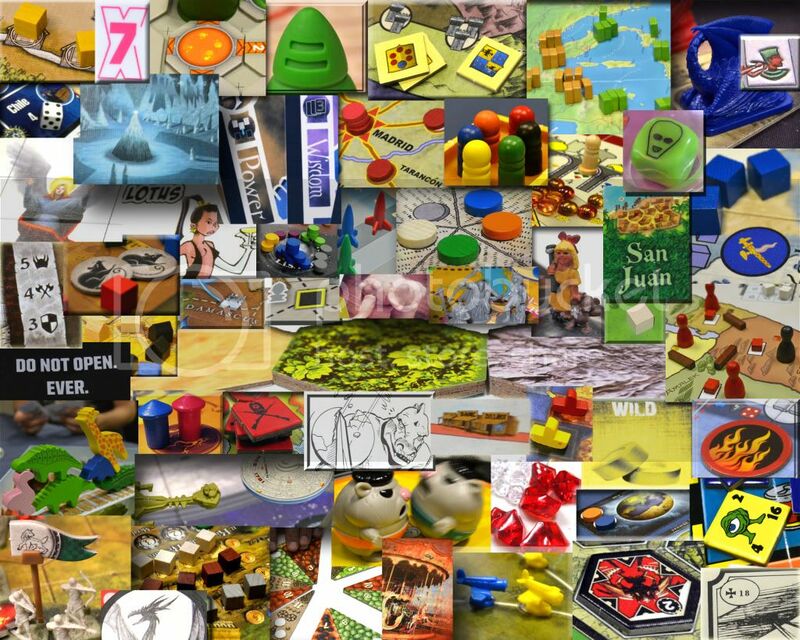 Of all the games you’ve played this year as part of the Hypermind BoardGamers, which is your favorite? Letters from Whitechapel – There was little doubt in my mind that Letters from Whitechapel would be our Game of the Year! It was the biggest “phenomenon” of the year in our group, and much like Macao last year, was a game that often ran 2+ hours but still saw 2 and even 3 plays on some nights. I understand that for some out there, it’s not “their” kind of game, but as I said in my review, it was just so consistent at delivering a fantastic and tense experience almost regardless of who was playing, and I’m very proud to have it as our Game of the Year. One other little tradition that I’ve done every year (I believe) is to create a collage using images from games that we played in the last year. I’m not giving anything away for doing it this time, but if you want a challenge, take a look below and see how many you can get. Without cheating (like, say, looking them up on BGG or Google), Chris Ingersoll got 46 of them (I think?) right. But you can also check yourself if you get stuck on a few. And feel free to comment with how many you were able to get! 55 Games from 2011! Can you name them all? Happy 3rd Anniversary, Hypermind BoardGamers!!! Hypermind BoardGamers Year Two Wrap-Up! Hypermind BoardGamers Year One Statistics! All of our Games of the Month! ([…] Troyes […]) were represented on the list, which is really cool and is sort of the whole point of the GotM! program, I suppose. Thanks for waiting for me to come back from CA. I’m proud to be a charter member of this group. I have had the best five years of gaming in my life because of this great group. And count all of the Hypermind Gamers as my friends and wonderful gaming family. Looking forward to coming back often in the years ahead. Thanks Chris for all you do for our little gaming family at Hypermind. We’re only on Turn 5? This game is going to take forever….